PicView is a new, free iOS app that enables users to add voice tags and annotations to images, videos and business applications. We’re giving it an early review, as the app is only available for iPad and supports only photos for the time being. 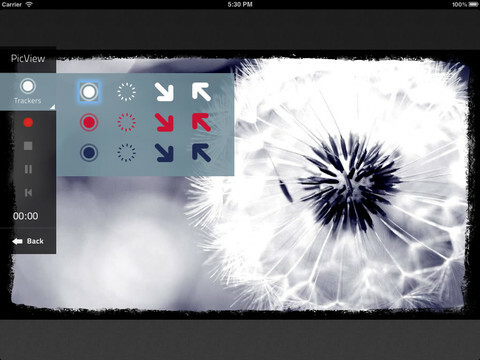 The app lets you take or upload an iPad picture and subsequently add voice annotations to them using a simple recorder, with the added ability of being able to pinpoint specific parts of an image with a short animation (called ‘Trackers’). When you’re done telling your story, you can apply Instagram-style filters to the shot, pick a frame design and add a title. After a final review, you can easily share the image + voice with your friends on Facebook or Twitter, or simply email it. You can also opt to publish it on a public PicView page (short example). For example: you might want to send a picture of multiple people to someone and explain who they are one by one (example), or snap a picture of a landmark and talk about what makes it special. When you’re selling something on craigslist or eBay, you can add annotations to the listing to make things clearer (example). You can also use PicView simply to remind yourself of where you were or what you were doing when you took that particular picture, or to send your loved ones photos from your travels with a little extra. Obviously, there are of use cases for something like PicView, but interestingly the company is also looking at business applications. Indeed, PicView might be a handy alternative for when you’re forwarding a presentation or spreadsheet to someone – rather than writing what the recipient should be focusing on, you can create a short animated video that guides him or her to the most important areas by voice (example). My one gripe with the app is that the actual recording is rather tedious if you want to add ‘Trackers’. You’re never sure where to click or if it’s recording or not (it automatically stops recording when you want to select a pointer, and you need to restart it every time after picking one). Other than that, smooth experience but nothing earth-shattering so far. The Belgian company behind the app says the technology behind the app is patent-pending worldwide. They’re currently working on an API that would allow third-party developers to integrate the functionality into their own apps. Stay tuned for more, when the API hits and/or support for videos and business applications gets added to the app.